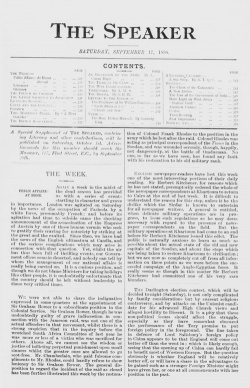 An Impression of the Army is an article written by Arthur Conan Doyle, first published in the United Kingdom in The Speaker: The Liberal Review, Cassell & Co., Ltd., London, on 17 september 1898. In this article Arthur Conan Doyle described soldier in the British Army in various locations around the town of Blandford. He gives detailed descriptions of both the officers and the soldiers that serve under them. The town of Blandford presented last week an interesting field for the man who should desire to make a study of the varied types taken from far and wide in the three kingdoms and broken in by that great levelling machine the British Army. On the Downs above the town lay twenty-five thousand men of all arms, and a good proportion of them were to be seen each evening in the old-fashioned High Street. Let me transport you there and ask you to stand with me ender the portico of the Crown Hotel, whence we may see them pass. All round us the officers are smoking their after-dinner cigarettes. Straight, soldierly figures these, clean-cut and slim, open-air men, with the rich tint of the wind and the sun upon their young handsome faces. And they are all young--that is the amazing part of it. The moustache may be tinged with grey, the ribbon upon the breast may speak of a long career, but the straight back, the alert manner, the bright eye, forbid you to say that they are anything but young. The subaltern may be a little smoother, the major rather more hawk-like, but there is always the same impression of youth. Old Time seems to be among the many enemies whom the British officer has laid low. And if we may dwell a little upon this group of cigarette-smoking officers under the homely Dorsetshire hotel-porch, how strange it is to see how the modern military history of the country is written upon their breasts. That blue and white ribbon tells you that the quiet gentleman with the eyeglass helped to give Arabi his coup de grace. It does not tell you that he was in the broken square at Abu Klea and has Fuzzy's shovel-spear trade mark upon his left hip as a local souvenir. Those two have the Afghan badge and followed Roberts on his three hundred mile march to Candahar. The next has the yellow and black stripe of the men who broke the tyranny of the Zulus. That bit of colour means Burmah, and the other stands for the Black Mountain Expedition. They are empire builders, these young, fresh-faced men with the cigarettes; and they are more than that, for they are the bodyguard of civilisation herself wherever she advances into the waste places of the world. The blood-worship of Ashantee, the dark fanaticism of the Mahdi, the barbarity of the Zulus, the brigandage of the hill-men--it is these loungers and their comrades who have eradicated them all. As you stand and smoke beside them a double tide of soldiers ebbs and flows along the High Street in front of you. Some are alone, but not many, for Tommy is a man of gregarious and companionable tastes, and three or four is his favourite number for an evening's outing. The climax of his joy is attained when his own group coalesces with several other ones to line a bar parlour with four dadoes of red serge. Then over many beers he will sing to a dismal tune, in a voice husky with emotion and tobacco, the most dispiriting ditties. Tommy will sing his own songs, the songs of his heart, and neither poet nor critic shall make a law for him. In vain you give him what you think he ought to like. He still insists upon taking what he does like, which is a very different article. There is the open window of one of those red-serged rooms opposite--smoking like the mouth of a gun. It is not "Mandalay" which comes rolling through it. Kipling--worse luck!--has never got below the Non-Com. smoker. The rank and file asks something cruder and more obvious. Listen to it. And down on the ground he fell. and so on, and so on, bad words, false sentiment, sham patriotism, but beloved of Tommy all the same. Go where you will in the canteens at Cairo, in the desert camp, in an Indian cantonment, and you will still hear the same crude verses and whining tune. Our present business, however, is not with the music of the bar parlour, but with this flow of life which has brought a woman's face to every window. Here is a line of the Connaught militia, rough cheery fellows with their weather-stained red tunics and dark green shoulder straps. Finer men, or more soldierly, than some of the Irish militia do not camp upon the Blandford Downs. They pass in and out through the lane of light thrown by the hotel lamp. Here is a group of the dark green riflemen, there a couple of long-legged, spur-jingling dragoons, here a mounted infantryman with his brown cords and blue putties, there a swarm of the stocky, clean-run lads with the pink faces and white facings who make up the rank and file of a short service army. They are young, but they have the virtues of youth. There is adaptability, enthusiasm, cheeriness. And, after all, this talk about the boy soldier in the British Army has been very much overdone. I have seen very many thousands of them within the last week near enough to look into their eyes, and the impression which they have left is that of alert manhood, smart and intelligent, at the very age for the maximum of physical work. A little campaigning, a little hardening, and they are still the soldiers of Barossa and Albuera, still the infantry which live again in Napier's fiery pages. The years have only added intelligence, education, and morality. Another Badajos or San Sebastian may be stormed, but never again will it be sacked. That stain upon the discipline of the British Army will not be renewed by the youngsters. You have but to stand here and use your eyes to convince yourself that this adverse criticism has been pushed too far. These bright-faced fellows, with their boyish swagger, their beloved forelock curled over the side of their forehead, their heels beating crisply upon the pavement as they pass, are as good material as an officer could wish to handle. They are the material which the officers in the portico have handled when they set right all those little entanglements above-mentioned. There may be more fire in the Highlander, and more devilment in the Irishman, but you will hear officers of long service say that when it comes to a hard pinch they are perfectly satisfied if they can have beside them the patient, docile, sturdy infantry of the English shires. Patient they are to a degree. For a week I have seen them heavy laden and overmarched, with a blazing sun above them, holding on tenaciously to their work. The grumblers met with no sympathy from their comrades. "God bli’ me, call this soldierin'!" I heard one limping infantryman cry. "Sorry you 'listed, ain't you?" cried the others. "Come, Jerry, give us a step dance, ole man." And the relations between the company officers and the men are admirable. You will see the rear company captain, like a hen with a straggling line of chickens, exhorting and advising the stragglers. "Give me your gun a bit. Now loose your straps. Well, if you must fall out, don't be more than two minutes." "No, sir, I won't." And he isn't. "A bay 'orse and two polo ponies!" cries the ostler. "Trap ready for the camp!" shouts a voice in the darkness. The Irish doctor is telling a story. "The Gineral inspected us until he saw Cornalius Kane, and then his stomach turned and he dismissed us." There is a murmur of laughter, the bustle of feet; hoofs clatter upon the stones, the door of the "Crown Inn" closes, and Blandford is its quiet, sleepy self once more. This page was last edited on 20 June 2016, at 12:55.